These weren't exaaaaactly supposed to be on Better Happier today, but I decided I couldn't wait until our Friendsgiving post (that will be chock full of holiday recipes!) 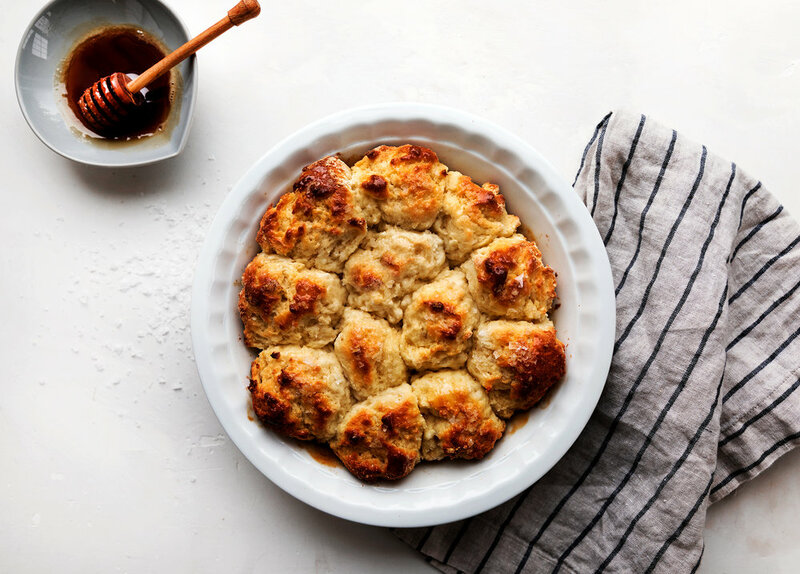 to share this delicious GF experiment (a cross between a traditional pull-apart roll and a biscuit) turned holiday hit with you. Are you interested in impressing your gluten-free guests this year? I have a few tips... are you ready? Stock up on gluten-free bread, gluten-free dessert, maybe have gluten-free beer on hand? 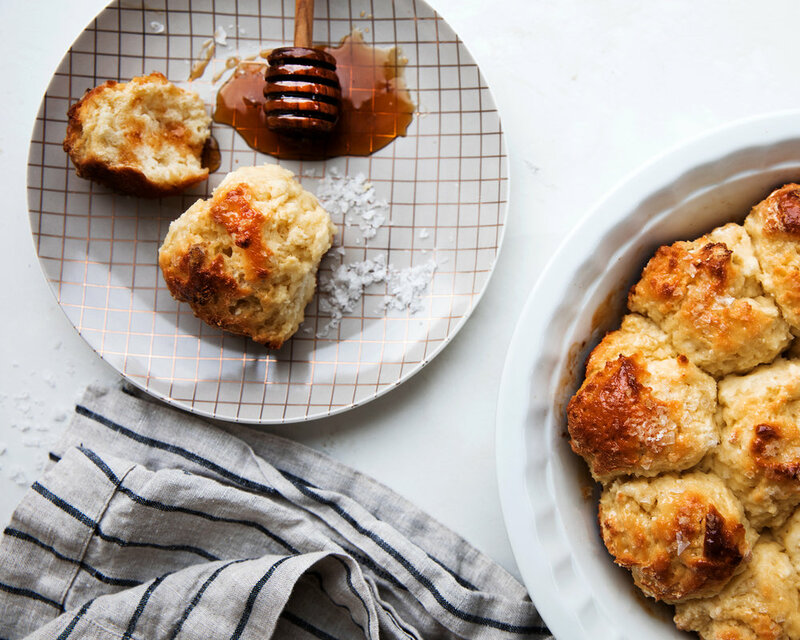 Or make these pull apart biscuits!? Okay, let’s be honest, if you have GF anything, homemade or not, they’ll just be grateful you thought of them. It's that simple. For me this feels like the first REAL DEAL holiday season that I’m fully embracing being gluten-free. I talked about it a little bit for last year's Friendsgiving, where we featured GF gravy (which really is the exact same thing just with GF flour subbed in) and GF Pumpkin Spice Whoopie Pies (again, the GF substitution here is pretty seamless), but this year feels more official, probably because I'm finally feeling comfortable enough to experiment in the vast realm of bread and bread-like things. A bit about why I'm GF now, in case you didn't know... after a smattering of digestive issues, I removed gluten from my diet in early 2016 when I decided to do Whole30. After nixing everything you nix on that diet my body was feeling amazing, but I felt my symptoms immediately return when I reintroduced gluten. It was a tough pill to swallow. Dipping fresh crusty bread into olive oil for me was something I would equate to a religious experience, so you can imagine I was in mourning for a while when the whole wheat category disappeared from my life. Since then I have had a couple, I guess I would call them self destructive experiments where I've tried to reintroduce gluten to see what would happen. Wow, was that a bad idea! GF life is here to stay it would seem, and I've found I really don't mind explaining to family / friends / everyone the whole dietary restriction thing and why I chose to do it. It's not as annoying as it seems to get the glare when you say "no I do not have celiac, yes I am gluten-free", because at this point that seems to be par for the course. What does still annoy me almost 2 years in is being that person that has to constantly be asking "what's in this?" or enquiring about gluten-free bread when there is none to be had, because sometimes you just really want a sandwich with the sandwich part. These have gone through a few phases of testing, and where I landed feels perfect, somewhere around a biscuit and a roll. Some versions were more roll-like and others like these, had a biscuit feel. 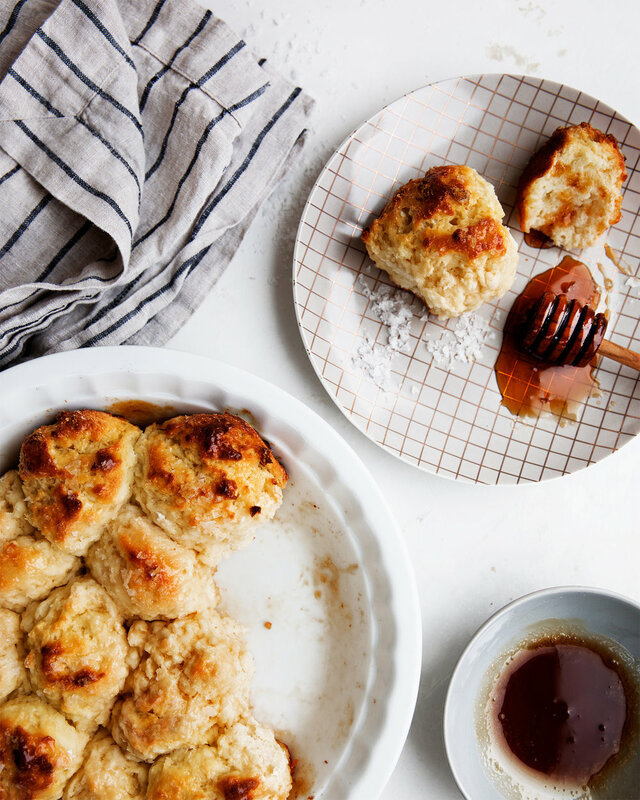 It's safe to say the yeasty honey butter drop biscuit was the biggest hit. The honey butter topping gets the outside a little crunchy with flaky sea salt sprinkled on top, while the inside stays soft. I keep pawning them off on people with a real sad to see you go face, because while I do not need to be eating a few batches of these leading up to huge meals we are currently planning, I'm lacking the necessary self control to stay away from them. Serving with extra butter is great, but warm honey for dipping? Even better. Preheat oven to 375°, and prepare a 9” round pie plate or baking dish with butter and set aside. Using a stand mixer, combine the flour, sugar and salt. In a small sauce pan over low heat, warm the milk to about 110° (use a thermometer for precise results to ensure you're not over or under heating the yeast). Remove from heat, stir in yeast, and let sit until bubbly, about 5 minutes. Drop 2" round spoonfuls of dough into the prepared baking dish, to make 12 you can place 3 drops in the center, with 9 on the outside. If the dough is seeming overly misshapen, you can smooth out the tops by putting a little bit of water on your fingertips. Lightly cover the dish with a towel and set aside to rise for 1 hour. In a small sauce pan over low-medium heat, melt the butter and honey together, whisking until smooth. Remove from heat. Using a pastry brush, coat the tops of the risen dough with the honey butter mixture, and a generous sprinkle of flaky sea salt. Bake for 25 minutes, or until golden brown on the outside. Serve warm with extra butter, or honey for dipping. Cup 4 Cup has yielded the best results for me in the GF baking department. I highly recommend trying it here, or use a GF flour that you've had great results with. By spooning the dough into the pan you're spending less time wrangling it, and creating a sticky mess, i.e. don't be tempted to overwork it! Since these are a drop style they don't need to be perfect in the pan. Want to make the dough ahead of time? These can be refrigerated overnight after you assemble everything. Cover the pan, refrigerate and pull the pan out to rise before baking the next day.